First of all: Legal or Illegal? We'd like to point out that we are in favor of any legal or illegal work; from painting a train in it's entirety by holding the train hostage, to getting paid by the city... it all makes up one big scene, and community, no matter what anyone says. According to the city hall, technically it's mostly illegal. According to those who paint "Who is anyone to determine what's illegal?" The term "street art" is used to define all artistic expressions carried out to get the attention of the public view. The way we see it, street art is created for the people and passebys, and Graffiti is done for writers by writers... and public view doesn't necessarily matter, as long as you're doing something you love (which is why we don't frown upon tags or throwies). Street art is just art in the streets... no matter how it is done. 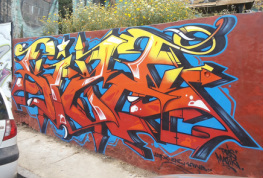 Graffiti has a certain structure and style, specifically in rectangular or square spaces, and it is mostly letters, and it is born from illegal activities in the 60's and 70's. Everyone's heard of Picasso -- He is extremely well known for cubism works. At some point, people who were moving their graffiti writing to more of an artistic career, decided to look into influential and revolutionary styles of the past, such as picasso's work, and decided to create similar pieces, using their knowledge of spray cans and rollers, and began to paint them in the streets. The outcome, is a wide acceptance on behalf of the community, and cubism is probably found not only in street art, but also in graffiti, due to it's 3D aspect. This is a street art style that arose in 1968, and it is linked directly with the communist party of Chile. It started as a simple style of thick outlines and simple colors for Pablo Neruda's UP Campaign, but as artists started joining the "Brigada", the talent level went up, and nowadays they have plenty of murals, in a style that was invented in Chile, which is very common in several areas of Valparaíso. Fauvism, Fovismo, or Fauvisme, is a style that is well known through Henri Matisse. The people who visit the city enjoy styles like this the most, due to a high use of color and requires a great deal of talent. In Valpo we have various artists who are very talented and are using spray cans, rollers and brushes to create their street art. The outcome is quite successful in getting the viewer's attention. Wildstyle is a series of arrows, spikes and letters which are very hard to decipher. Many artists seek to acheive this level of talent when it comes to writing graffiti. The founders of this style were Tracy 168, Stay High 149 and Zephyr in NYC. In our city, we have legends of Chilean wildstyle who have their artwork intact, such as Fisek (Stgo Under Crew), Hes, and ACB (R.I.P. ), who, at her 22 years, was putting Chilean Graffiti on the map in New York City. Blockbusters are big letters, that can normally take up an entire wall. In Valpo, we have crews who create large, lively letters, and don't necessarily ask for permission, which makes it the more interesting, as to how the process is created. 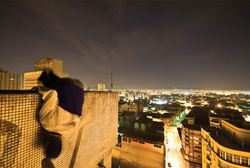 A style of writing that was created in Sao Paulo, Brazil, as a form of protest from the misfits of the Brazilian society. It is extremely risky and normally, "Pixadores" look to put these in hard to find places. This is one of our favorite styles due to the meaning and purpose behind this crazy art. Many artists in Valparaíso have used this style; not for the beauty, but for what it represents. Artitsts like Cripta from Sao Paulo, Brazil, have made this style famous for the world, and in our city we have a few from "Dion"(¿QM? 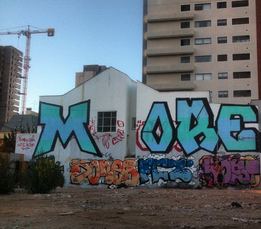 Crew), a Pixador from the same country, who has painted with local Pixador, Osama. 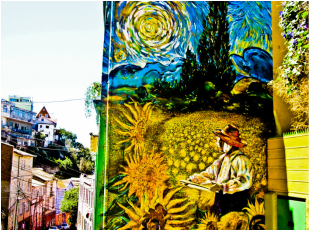 Join us on our street journey through Valparaíso, as we run through styles, take a few pictures, and show you how our walls have become the voice of our city.